Parents Review (1989). 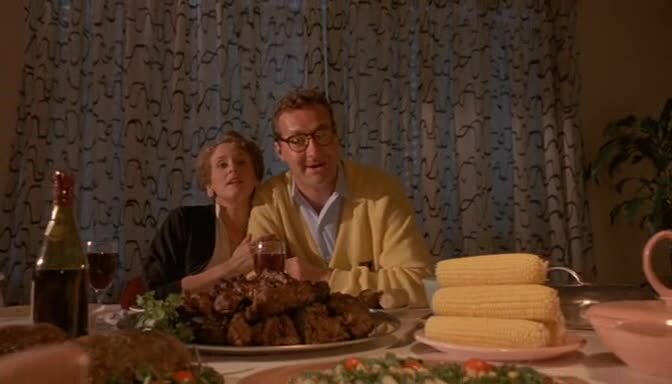 Randy Quaid as you have never seen him before as a cannibal? – Stigmatophilia's gore splattered corner of insanity. Home › Reviews › 80's horror › Parents Review (1989). Randy Quaid as you have never seen him before as a cannibal? Parents Review (1989). Randy Quaid as you have never seen him before as a cannibal? I recently revisited this late 80’s strange piece of cinema remembering only that it was weird and I liked it. It has been at least 20 odd years since I saw it so I was interested to see how it held up in my memory. If you read the online comments regarding this film opinion seems very divided, either heralding it as a underrated gem, (several sources comparing it to the work of David Lynch) or distasteful and not as clever as it thinks. Now two things sprung to mind in this recent outing, firstly it was a lot gorier in parts than I remember ( I suspect the VHS rental I first viewed was cut), and secondly it was very reminiscent of the bizarrely macabre Society not in a direct way but there was something deliciously disgusting about the whole affair the likes of which I can only compare to Brian Yuzna’s 1989 venture. This seems to have been a cinema screen directorial debut for seasoned actor/director Bob Balaban (having done mainly TV episodes, or made for TV films beforehand) and it did not surprise me to discover he went on to direct a few episodes of cult 90’s kid show Eerie Indiana after this, as there are some obvious stylistic comparisons. The film focuses on a child’s point of view, being a simple premise, Michael Laemle starts to suspect his parents are cannibals. This is not an intentional spoiler, but was a direct marketing line. 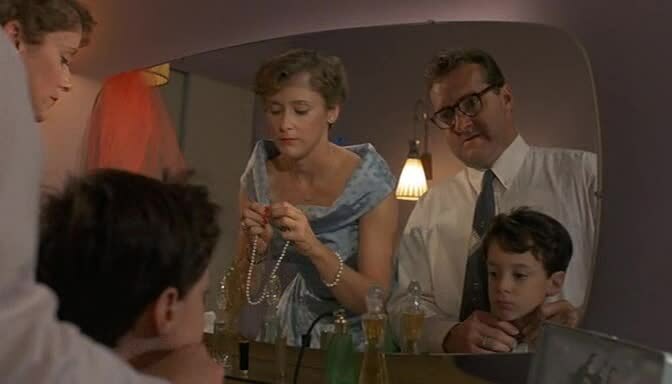 The film is shot in a strange 50’s retro kitsch world where Michael’s mother is the perfect housewife, and his father a hardworking supporter of the family. The All American dream with a nasty edge for behind this facade of domestic bliss lies a dark secret. As the film focuses on the child’s point of view it makes for an interesting take, thus placing a strong focus on the psychological, because for most of the film you are never quite sure if this is a child’s nightmare fantasy or reality. I can see where the reference to Lynch comes from instantly as the film flows from scene to scene intersected with some surreal and dreamlike sequences which provide little explanation. These come in the form of haunting and gory imagery. The cinematography in this film works to the effect that the horror is conveyed in the most unlikeliest of places, on the contorted faces of the caregivers, (people this child should be able to trust), at the family dinner table, within the realms of the perfect family home. I loved the sets and the costuming, creating this soap commercial 50’s world of perfectness, where horror can lurk behind every corner. There are plenty of shots of meat platters and mincing of meat, adding to the Grand Guignol of the whole affair. Knowing what could be on those plates is enough to churn even the strongest of stomaches as Michael observes his more than slightly sinister parents devouring each mouthful with revolting delight. Randy Quaid is superb in his portrayal of the father as he becomes more and more sinister in his son’s observations, bullying and abusive. He is far from the perfect father image he wants the whole world to see. Mary Beth Hurt as mother Lily is the classic Stepford Wife who dotes on her family and worries over what creations to come up with for the families ‘leftovers’ as she so delicately names them ( the origin of which Michael is so desperate to know). Behind this mask lies the hint of a woman on the edge desperately trying to hold everything together. 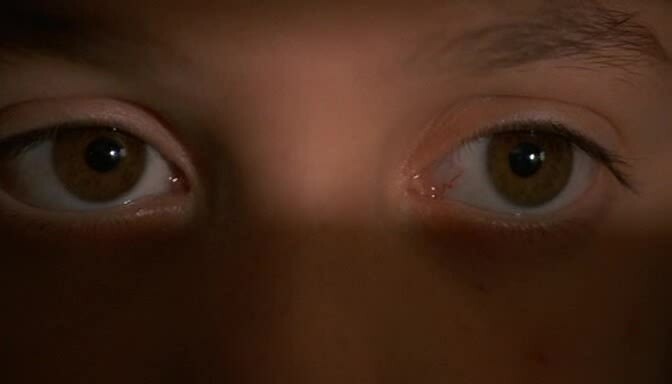 Bryan Mardorsky as Micheal the boy is perfectly neurotic, sad, and never smiling. His bleak portrayal of a child in crisis contrasts beautifully with the gleaming smiles of his could be psychotic parents. 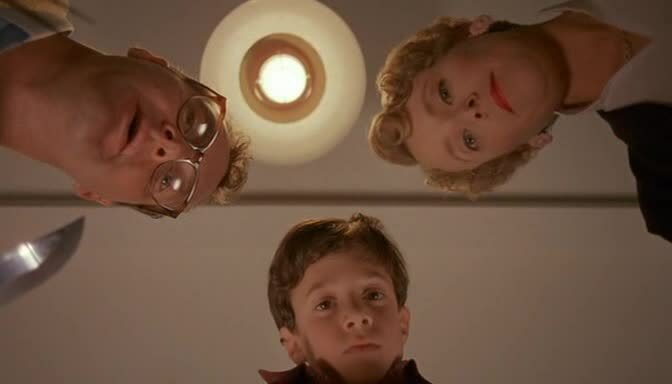 Most of the film plays out in these family interactions as the terror mounts through the boy’s eyes, at the family dinner table, or through his spying and catching glimpses of things he perhaps should not see, the hushed conversations, the worry on his parents faces as they wonder what he has overheard. As they start to worry about their son’s state of mind, and his murderous visions of family life catch the attentions of the school counsellor, questions arise to just what is at the bottom of Michael’s concerns over his family’s menu choices. Another noteworthy performance in the piece is that of Sandy Dennis (Oscar Winning actress for her role in Who’s Afraid of Virgina Woolf) as Michael’s school counsellor Millie Dew, a woman certainly in need of her own form of counselling she scrabbles around trying to get to the basis of Michael’s fears. Parents was one of Dennis’ final roles before her death in 1992 of Ovarian cancer. Parents can be challenging to watch at times, given the subject matter, and obvious scenes in which psychological abuse occurs as the father tries to get a grip on the situation. It would seem that this is what bothered the critics of this movie the most, given that they saw it in poor taste. However challenging for me equals thought-provoking and I have to admit I really enjoy this type of film, yes it is distasteful, even more so as it is marketed as a horror/ comedy. On a comedy level there are no laugh out loud moments, as it is mainly sick and twisted, and on this point the film fails, but then it cannot be taken wholly seriously either, so it drifts in a netherworld of some sort of undefined sub genre of horror more like a bizarre sideshow spectacle with strong freakish overtones. Parents is certainly unique and unpredictable I will give it that though, and it keeps you guessing right up to the end. Enjoy is probably not a word highly associated with this picture, but I did enjoy it very much so, engrossing, and gross, odd and surreal, it is one of those films that will stick in your mind. Definitely bloodier than I remembered, but it was a film that did stay with me as one of those weird films which I rented on video some time during the early 90’s, one which no one else seems to have seen and never gets an airing on tv. It is a shame though because it is unique and an interesting premise and should have deserved more success than it actually achieved. One for all those with a dark and twisted sense of humour. ‹ The Gore Splattered Corner Presents: Cinema Sewer, an interview with Robin Bougie.